Eller van Buuren (1981) started playing the guitar when he was 8 years old. He grew up in a little town near Leiden in Holland. He went to high school at the Stedelijk Gymnasium in Leiden (pre-university school). In 2001 Eller got offered places at both the Rotterdam Conservatory (one of the famous music schools of Holland) and the newly started Rockacademy in Tilburg. He chose the Rockacademy. Graduating in 2005 he won a national prize for ‘Best Thesis’, which was (of course) about music. Eller plays different styles of music, from Heavy Rock to Blues and sometimes even Jazz. He is a singer and songwriter of music across all spectrums from Pop to Rock and EDM (electronic dance music). Between 2008 and 2012 and in addition to his music career, Eller was also a professional photo model. Eller has a keen passion to share his knowledge as a teacher. Since 2002 he has taught guitar across different levels of music in his own music school. Between 2008 and 2012 he also taught at the Herman Brood Academy. Then, in 2012, Eller was made Professor in Music at Haarlem’s Music Academy. Eller has played with many artists and released different tracks in different genres of music worldwide. Scroll down to see the “Discography” on this page for more info on tracks and artists. 2013 he releases the long awaited album “Eller van Buuren presents ADM”, on which he honours his brother’s (Armin van Buuren) music. Click here for more. Eller likes to create music, but not only in the studio. He finds most of his joy on stage. He has travelled the whole world touring with his brother (Armin Only shows) as well as his own solo shows. He easily adapts to any genre of music, whether it’s the pumping sounds of EDM, Heavy Metal “7-string I kill you music” or fragile singer/songwriter music. 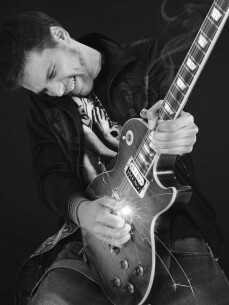 Eller has developed from guitarist to singer/songwriter. He is able to write and record music on demand in his own studio. Whether it’s acoustic sounds, electric guitars, solos, riffs or anything you can find in nowadays’ music. Eller is both capable and up for it, “as long as it has the right energy”. To date Eller is still active as a teacher and has about 50 guitar students who attend his own music school. He is also still a teacher at the conservatory of Haarlem called The Music Academy.